This group is for anyone interested in working with stained glass. We have many facilities to enable cold lead or copper foil work and some hot painting, slumping and fuzing. Beginners will be taught but please ring Judith first. on 01629 630202 Those with experience may turn up and pay for materials they use, or bring their own. Intermediates may want to experiment and make use of the experience of others there. Charges will vary according to what is used and will cover costs. 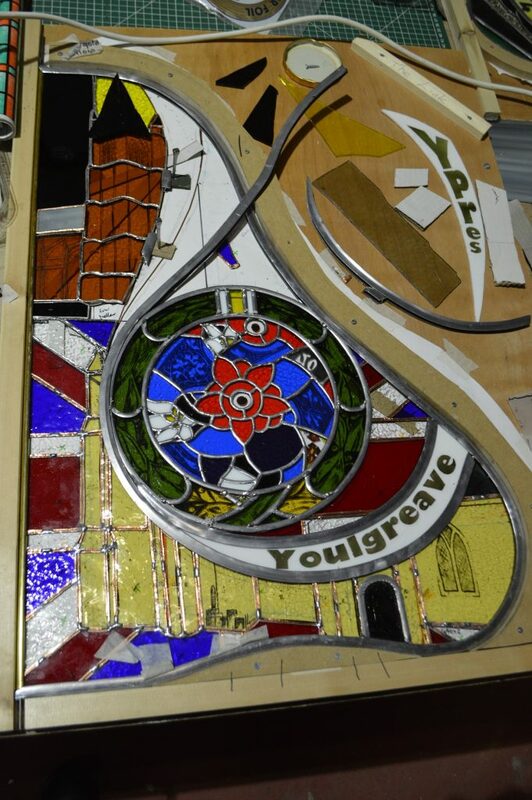 During March, April and May 2018 the group will be mostly working on the 1914/18 Youlgrave Village Community Stained Glass Sculpture. You are welcome to join in. Please come prepared in old clothes, solid shoes, soap, and plasters. · All coach travel will be with Slacks Coaches. Wheelchairs can be taken but access to the coach is by the steps. · Departure from Youlgrave on the morning of Friday 17 August 2018 at approximately 7.00 a.m.
· We have not made a block evening meal booking so that people have the flexibility to do as they please. However, we can pre-book 3 course evening meals at Brasserie Kazematten (200m from The Menin Gate) at a cost of £32 per person if you wish. Should you wish us to book this you will need to let us know on 24 February. · The cost of the trip including all coach travel, ferry crossings and bed and breakfast accommodation is £356 per person for those sharing a double or twin-bedded room. The single supplement if you do not wish to share is £165. If you are a single traveller we need to know as soon as possible whether or not you want to pay the single supplement or are happy to share with another single traveller to keep the cost down. · You must have travel insurance to come on this trip. This may be either through your own personal travel insurance arrangement or it is available through Slacks Coaches. We will arrange this with Slacks if required. · Excursions are all included in the cost (except for entrance fees where applicable). You may choose to come on all or some of them. You are not obliged to come on any, but the overall cost of the trip will remain the same whether or not you come on the excursions. Afternoon – Visit Talbot House (TocH) at Poperinghe – after seeing the house and museum we will enjoy a Band Concert by Youlgrave Silver Band with afternoon tea in the garden of Talbot House. 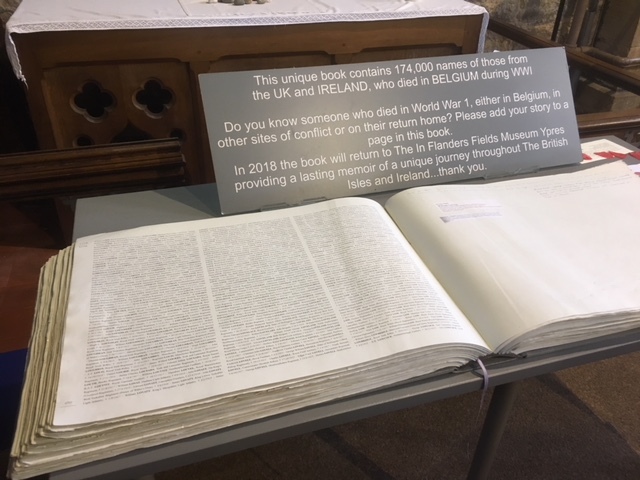 Afternoon – Ceremony in Ypres Cathedral during which the glass memorial piece will be presented to the people of Ypres and the Youlgrave Silver Band will play. 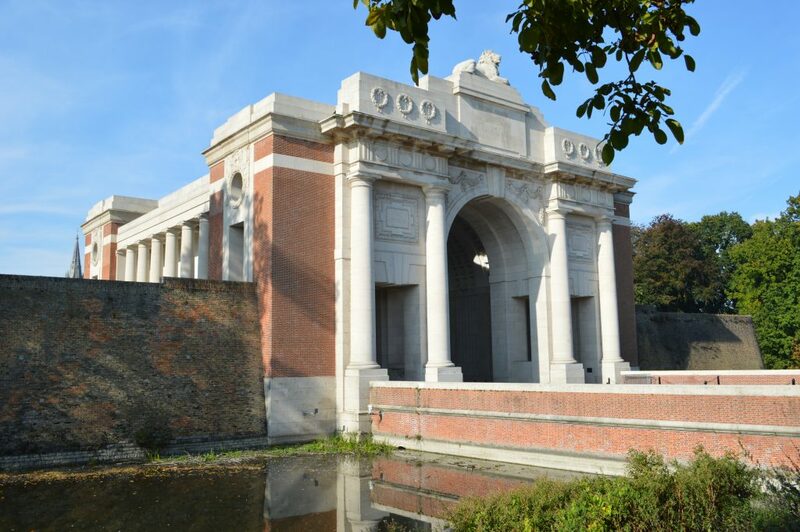 Evening – attend The Last Post Service at The Menin Gate to lay a wreath and during which the Youlgrave Silver Band will play. All day – Visit Thiepval Memorial on The Somme (approximately 65 miles away motorway) and nearby Villers-Bretonneaux and visitor centres. Evening -There will be a concert by The Youlgrave Silver Band. We are currently arranging for a team of Bellringers led by David Camm to ring a full peal at St. George’s Church in Ypres. This could take place on any day over the weekend and the precise timing (it will take 3 hours) is to be finalised. 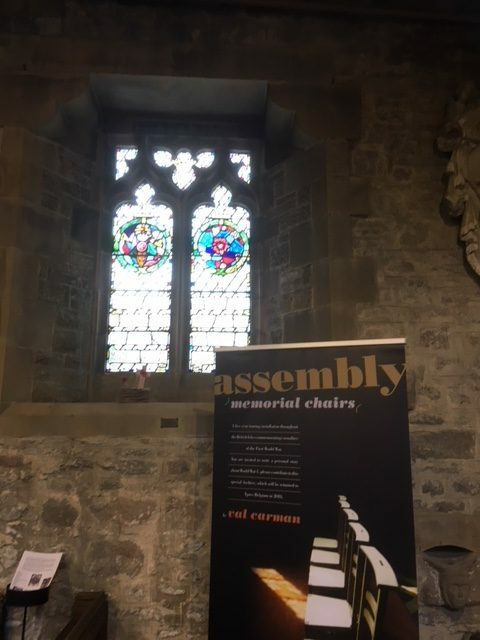 The story begins in 1922 when Charles Waterhouse installed two stained glass windows and a banner in Youlgrave All Saints church in memory of his brother Rennie Compton Waterhouse who was killed at Gallipoli in 1915. The stained glass for the windows was gathered from the ruins of Ypres Cathedral in Belgium and now exists in the beautiful stained glass memorial windows. This event has linked the communities of Yougrave and Ypres since that time. Next year, being the 100th anniversary of the end of WW1,is an opportunity to cement the established link and take it on in the future. Youlgrave Silver Band has the opportunity to contribute to an event in August next year 2018 which will do just that. The Youlgrave1914/18 Community Group is, this winter, creating a sculpture in memory of the local men killed in WW1. This sculpture is to be presented to the people of Ypres at a ceremony in Ypres Cathedral in August next year. The arrangements for the presentation are made and travelling etc. is available so that people from Youlgrave can support the event. At the moment it is anticipated that up to 100 people will do so. We have filled one coach for the trip already. Youlgrave Silver band will play at the presentation of the sculpture in Ypres cathedral, and three other concerts at related venues and be involved in the “Last Post” ceremony at the Menin Gate war memorial. The sculpture –was the culmination of a competition winners designs held in the three local parishes. And is being made after a summer of training a team in stained glass skills. 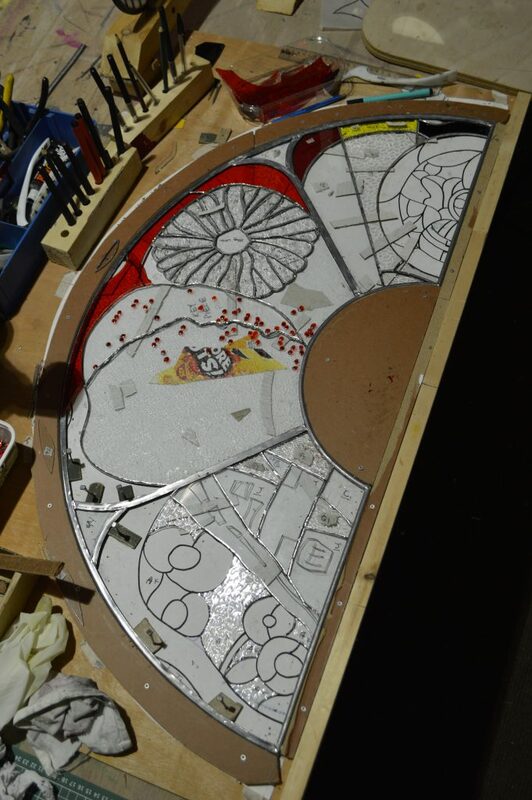 It will be about 2m high, consisting of a base of local lime stone pillars supporting a local oak wheel of stained glass lit from beneath. Through the centre there will rise an oak trunk – from Chatsworth. 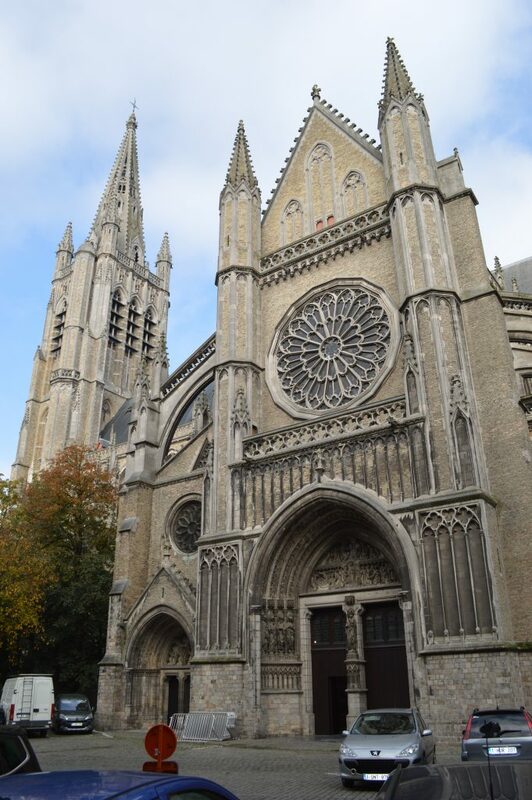 The lower section will be surface charred and as it rises through the stained glass, it will look organically carved in clean but natural, lines, as the spire of Ypres Cathedral and the tower of All Saints, Youlgreave, signifying a better future. 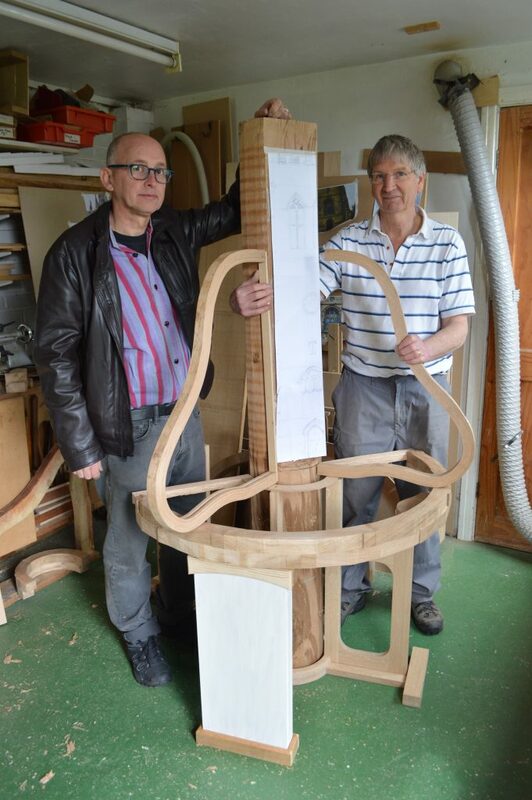 Four arches will cross the central oak in two bell shapes of stained glass, representing four related subjects. Sacrifice, reconciliation, the link, and future hope. In the longer term it is intended to share the sculpture with Ypres. It is designed to be split into two parts so that it can be moved in part or completely between Ypres and Youlgrave. This will enable it to be used at relevant events in the future and in particular at remembrance services in November each year. The sculpture will be a physical recognition of the 100th anniversary of the end of WW1 and a lasting sign of the spirit of remembrance in both communities for years to come. Also it will be a reminder to all that military conflict is to be avoided in years to come. The band and the communities will have a physical reminder of the cost of war and a further reason to remember Rennie Compton Waterhouse and his comrades from Youlgrave in the future. Philip Smith (concept designer of the art piece)alongside the wooden sculpture which will house the Stained glass quadrants and table tops. 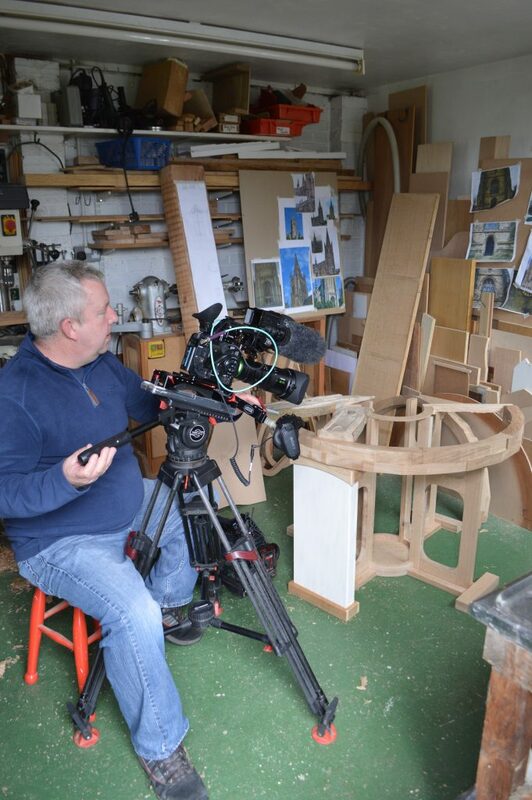 Wood sculptor Martin Hill . The Youlgrave 1914-1918 Community Group originally started with four members and ran several community based events in conjunction with other local groups. We soon realised that we wanted to commemorate the centenary of the Great War in a permanent and positive way. Where other organisations seemed to be reflecting on the past by updating existing memorials we felt that our contribution needed to be more forward looking and ambitious. We identified the unique features of the stained glass window in All Saints’ Church as being something different we could build on. This into grew into a desire to renew the link between us and Ypres to inspire the design now nearing completion. We knew that another stained-glass window would not be practical and we wanted something more portable which led us to consider a three-dimensional structure. Eddie Oldfield, one of our founding members, came up with the idea of a design in two halves which could be located separately in Youlgrave and Ypres and exchanged at intervals to maintain the link over future generations. The next aim was to involve as many members of the community in the design and creation of these pieces as possible. As a small self-funding group we began to seek financial assistance and were directed towards Nottingham University’s Hidden Histories Project. They expressed an interest in the history of our stained-glass window and especially in its European connection, in addition some of their criteria included the exploration of the hidden history of areas through learning new skills. 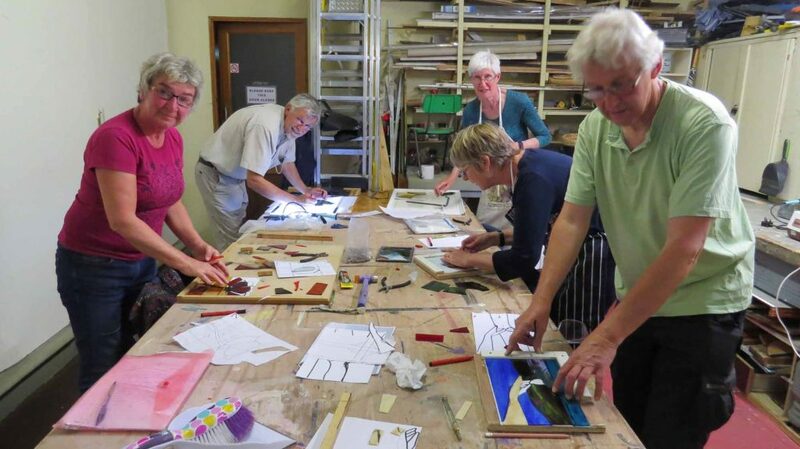 We identified the idea of running a Stained Glass Course to train people to create their own stained glass pieces and to go on to hone their skills to help to create this memorial piece. Another aspect of the involvement of the community was to run a design competition open to all members of the parish early in 2017. The key challenge of the overall design was to deliver something which was part of a whole but could also stand alone. 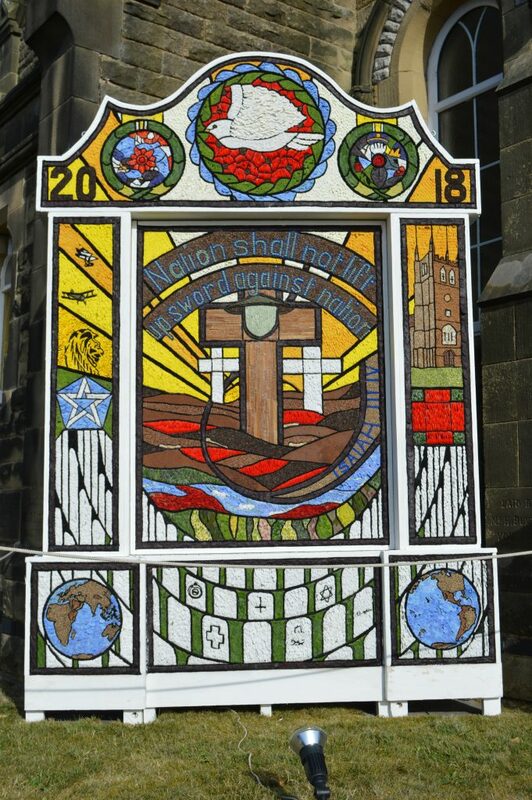 The concept of the current design was proposed by Philip Smith and designs for the stained-glass panels were worked up from the many excellent designs submitted by the pupils of All Saints’ Church of England School. and the spire of St Martin’s Cathedral, Ypres and has been sculpted and carved by Martin Hill of Sheffield. The base glass has been designed to provide a firm foundation for the four quadrants and is only lightly coloured to allow lighting to pass through. 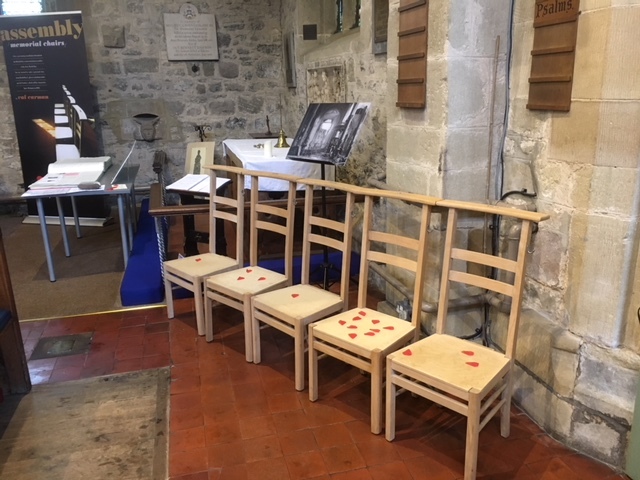 The wooden frame which will hold the four pieces of limestone symbolic of Commonwealth War Grave Headstones has also been created by Martin Hill. The limestone has been sourced from the local quarry which, in the 1920s produced the original headstones for the Imperial War Graves Commission. We are endlessly grateful to all the people from the community who are supporting our project in any way and especially appreciative of the hundreds of hours of work which has been committed so far. We are completely in awe of the talents and expertise which have been so freely given.